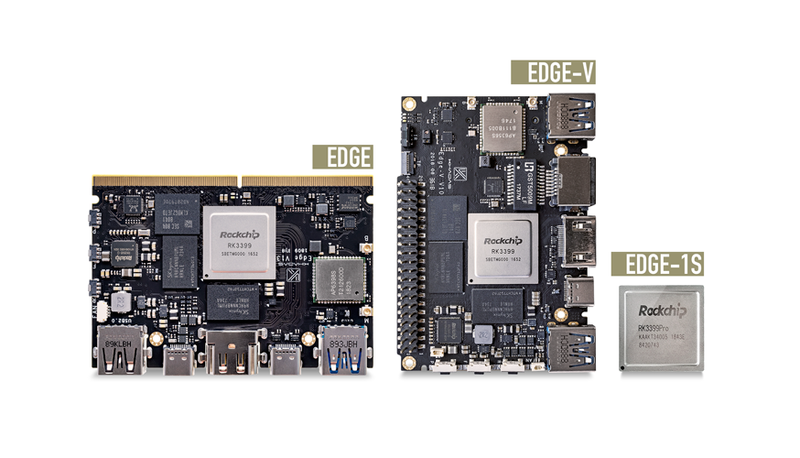 Vamrs has launched their “Toybrick RK3399Pro” SBC that runs Linux or Android on the AI-enabled RK3399Pro. 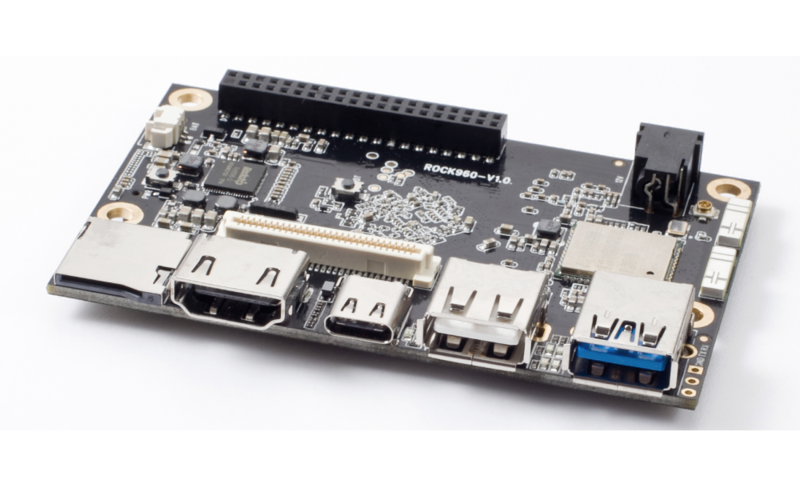 A cheaper Model C version of its RK3399 based Rock960 SBC is also released. 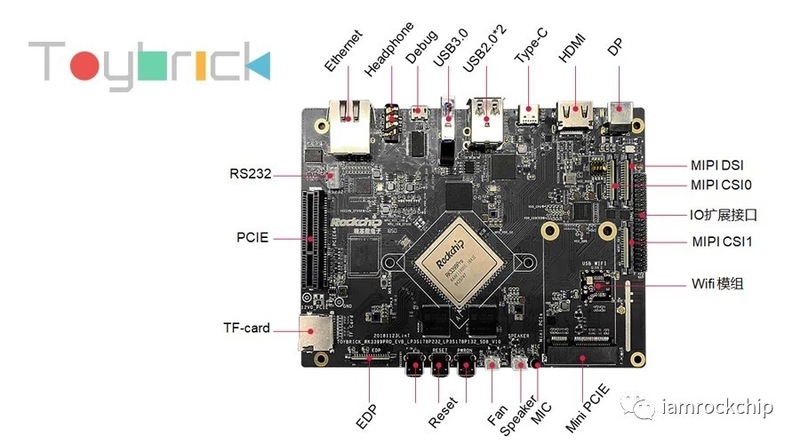 96rocks, Vamr’s community site announced that the TB-RK3399Pro is currently available only from Rockchip in Fuzhou, China, but Vamrs is willing to ship a small number of oversea orders. 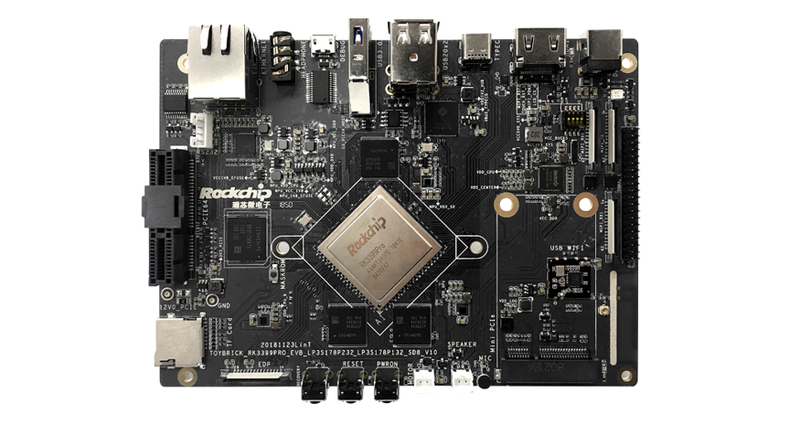 The company also developed Rockchip’s official dev board for the RK3399 SoC, named the Rockchip RK3399 Sapphire. The RK3399Pro is the same as the original, with 2x Cortex-A72, 4x -A53, and a Mali-T860 GPU. The difference is an addition of an up to 3.0-TOPS performing Neural Network Processing Unit (NPU), which supports Tensorflow, Tensorflow Lite, Caffe, and other deep learning systems. The Toybrick teaser page lists a 3GB RAM, 16GB eMMC version and a 6GB/32GB version, which are “under $299.” The SBC is equipped with a microSD slot, an Ethernet port (presumably GbE), plus a WiFi module. It also includes a USB 3.0 host and Type-C ports as well as dual USB 2.0 ports and a micro-USB debug port. 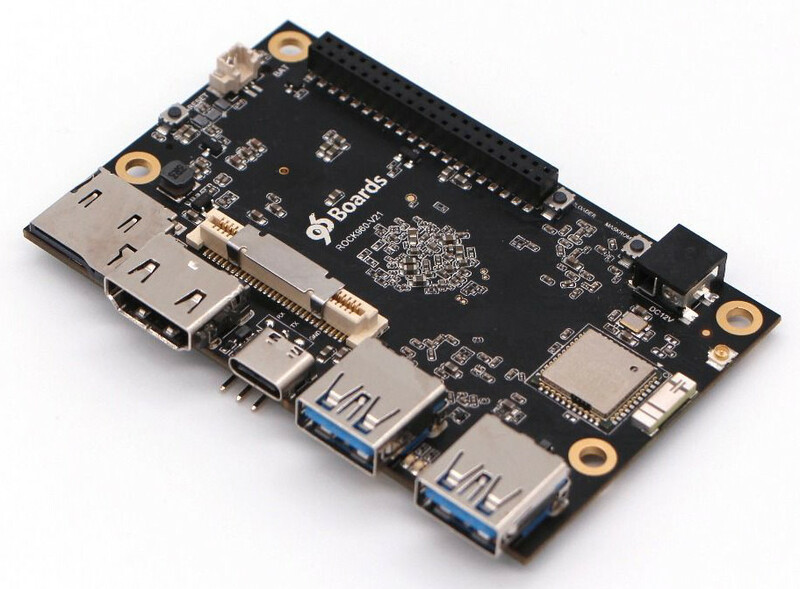 The Toybrick RK3399Pro is fitted with DP 1.2 and HDMI 2.1 ports, and also MIPI-DSI and eDP display interfaces. According to Vamrs, the SBC enables dual MIPI-CSI connections driven by the RK3399Pro’s “dual ISP with pixel processing capability of up to 1300W pixels. Available also is an 8-channel digital microphone array input, a speaker interface, and a headphone jack. The RK3399Pro is also fitted with RS232 and fan interfaces, and also a reset button, plus 4x PCIe lanes and a mini-PCIe slot. The SBC runs dual-boot, with pre-installed Android and Linux with one-button OS switching. Their product page promises to start shipping this month in limited quantities, with the price is yet to be settled, but at least one version is projected to sell for under $299. The Model C, which sells for $69 offers only 1GB of RAM and offers an empty eMMC socket instead of 16GB or 32GB, plus the pre-existing microSD slot. For the RAM, it offers the faster LPDDR4 instead of the LPDDR3 on the earlier models. The 1GB of RAM could be insufficient for exploiting the functionality of the RK3399. The Model C has switched to a USB 2.0 Type-C without DP, from the USB 3.0 Type C port with DP support, leaving only the HDMI 2.0 port. It utilizes a lower-cost version of the dual-band 802.11ac module without 2×2 MIMO. The new module clocks at 200Mbps instead of 867Mbps. The Model C board offers an M.2 (4x PCIe 2.1) slot that enables an optional M2 Extend board for NVMe SSD. 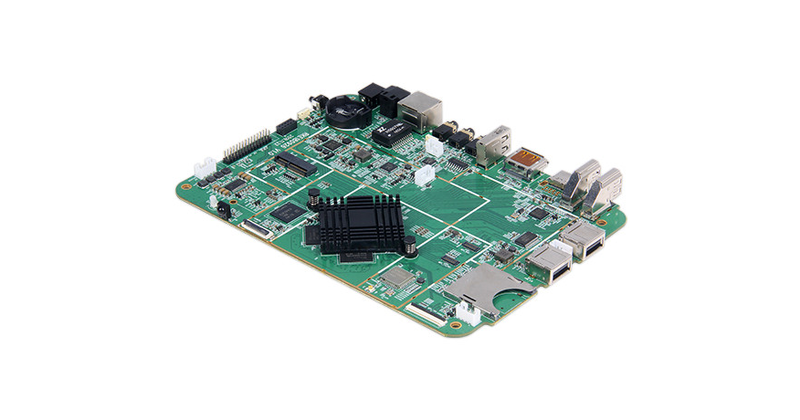 Available also is MIPI-DSI and CSI, a USB 2.0 host port, 40- and 60-pin expansion connectors and a wide-range 8-18V input. The $69 1GB version is available by Seeed, but a product table speculates the Model C may soon be available in 2GB ($79) and 4GB ($99) models. The Toybrick RK3399Pro SBC is available for pre-orders starting at under $299 in limited amount, and shipping to begin as early as this month. More information can be found in Vamrs’ TB-RK3399Pro announcement. The Model C is available at Seeed for $69 with 1GB RAM.